HeLa whole cell lysate (ab150035); NIH3T3 whole cell lysate. 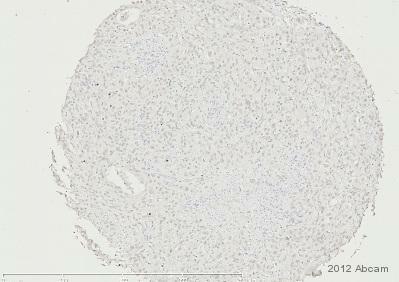 IHC-P: Human pancreas FFPE tissue sections. This antibody was purified using protein G column chromatography from culture supernatant of hybridoma cultured in a medium containing bovine IgG depleted(approximately 95%) fetal bovine serum, and filtered through a 0.22 µm membrane. Our Abpromise guarantee covers the use of ab50702 in the following tested applications. WB 1/50 - 1/100. Predicted molecular weight: 265 kDa. Lanes 1 - 4: Merged signal (red and green). Green - ab50702 observed at 265 kDa. Red - loading control, ab176560, observed at 50 kDa. ab50702 was shown to specifically recognize CREBBP in wild-type HAP1 cells along with additional cross-reactive bands. No band was observed when CREBBP knockout samples were examined. Wild-type and CREBBP knockout samples were subjected to SDS-PAGE. Ab50702 and ab176560 (Rabbit anti-alpha Tubulin loading control) were incubated overnight at 4°C at 1/100 dilution and 1/10,000 dilution respectively. Blots were developed with Goat anti-Mouse IgG H&L (IRDye® 800CW) preabsorbed ab216772 and Goat anti-Rabbit IgG H&L (IRDye® 680RD) preabsorbed ab216777 secondary antibodies at 1/10,000 dilution for 1 hour at room temperature before imaging. IHC image of KAT3A staining in human pancreas formalin fixed paraffin embedded tissue section, performed on a Leica Bond system using the standard protocol F. The section was pre-treated using heat mediated antigen retrieval with sodium citrate buffer (pH6, epitope retrieval solution 1) for 20 mins. The section was then incubated with ab50702, 10µg/ml, for 15 mins at room temperature and detected using an HRP conjugated compact polymer system. DAB was used as the chromogen. The section was then counterstained with haematoxylin and mounted with DPX. Staining of HeLa cell lysate with ab50702 at a dilution of 1/5 and Goat anti-mouse secondary at 1/200. Publishing research using ab50702? Please let us know so that we can cite the reference in this datasheet. Thank you for submitting an Abreview for ab50702. As you may have noticed, your review has now been published on our website.